Terry’s voice is a truly impressive instrument, not only because of its natural power, but also because of her versatility. She is a gifted singer of jazz and blues in the tradition of Connie Boswell and Billie Holiday, but is equally comfortable with the subtle beauty of traditional folk and contemporary songs. Add to this her uncanny ability to find the perfect harmony line, and, in a powerful blend of their two voices, you have a real treat for the ear. As if this weren’t enough, Terry is also an excellent player of the harmonica, mandolin, fretted dulcimer, and rhythm guitar. Greg is an outstanding guitarist whose fingerstyle approach owes a lot to his heroes, guitar legends such as Reverend Gary Davis, Big Bill Broonzy, Nick Lucas, Phil Ochs, and Rolly Brown. His playing is the solid basis of Magpie’s sound, providing whatever is called for, whether it be a hard-driving rhythm, or a ringing lyrical beauty. From a slow Scots air or a plaintive ballad to a rollicking ragtime blues or infectious swing, Greg covers it all. His high baritone voice has equal range and his captivating interpretation gives power and beauty to the full spectrum, from growling blues, to a Chilean lament, to a sweet croon. From the beginning Terry and Greg’s interests in various musical styles have led them to be eclectic in their repertoire. Rather than confine themselves to a single style, Magpie has always embraced a musical rainbow, and with impressive proficiency in each different genre. From traditional, classic country, swing, and blues of the nineteen twenties and thirties, to contemporary songs written by themselves and others, Terry and Greg cover a lot of musical ground. With the power of their delivery, Magpie is well known for their performances of hard-hitting topical songs. They are well-known as regular performers on Phil Ochs Song Nights, organized by Phil’s sister, Sonny Ochs, since 1984. Politically, their viewpoint has been shaped by their life experiences. Greg began to play music in the early sixties as a direct result of the Civil Rights Movement. His father worked for the National Urban League, and members of the family became involved in local action in the Movement. Terry also began singing at that time, and spent many of her childhood summers with her mother’s family in the deep south where she witnessed the cruelty of racism and the power of the Movement. She also was a witness to the shootings at Kent State on May 4th, 1970 when National Guard troops fired into a group of students protesting the war in Vietnam. Terry and Greg continue to reflect these experiences in their own work as they frequently raise their voices in support of the ongoing struggles for civil rights, freedom, justice, and peace. Over the years, Terry and Greg have become distinguished for producing programs of music for museums (including the Smithsonian Institution), schools, and other special events. They are master artists with the Wolf Trap Institute for Early Learning Through the Arts, and in that capacity have worked in many residency programs and teacher training workshops, demonstrating their methods for utilizing music effectively as a tool for early childhood education. Terry and Greg have many years of experience working in schools, performing for children and families. They have developed several special school programs for students of all ages including two on the environment and others on historical themes such as the Great Depression and the nineteen sixties. Terry and Greg are internationally known for their musical work in the environmental movement. Throughout their career, they have devoted a tremendous amount of their time, energy, and music to environmental causes. They are considered to be among the very best in this field of music and their performances are in great demand by environmental action and education organizations. Their musical work has supported the work of such notable groups as National Audubon Society, National Wildlife Federation, the National Wildlife Refuge System, the National Park Service, and Hudson River Sloop Clearwater. Earth Day 1998 found them performing at Harpers Ferry National Park where their well-known anthem, “We Belong to the Earth” was a perfect finale to a speech by President Clinton. They have been featured presenters for statewide environmental education associations around the country. In 2000, Magpie collaborated with scientists at the Smithsonian Environmental Research Center and created a “museum musical,” the first of its kind, utilizing a museum display as the set for the show. The show, Tales of the Blue Crab, premiered at Smithsonian’s Discovery Theatre and ran for the month of April. It’s full of rollicking, good-fun songs all teaching about the life cycle of the Chesapeake Bay’s most famous resident, callinectes sapidus, the blue crab. In the fall of 1998, in a fitting tribute to Magpie on the occasion of their 25th anniversary, members of the Washington Area Music Association awarded Greg and Terry the “Wammie” award as traditional folk duo of the year. 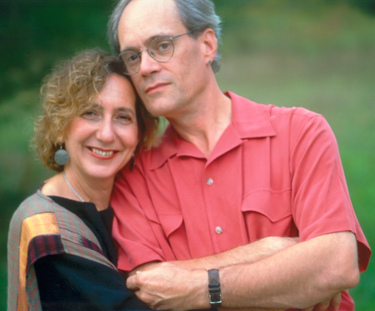 They also received the 1999 Addy Award for their song “Take Me Back to Harpers Ferry” and their soundtrack for the video by the same title, continuously shown at the Harpers Ferry National Historical Park’s Visitor Center. Terry and Greg have been heard on many recordings, including 8 of their own, 2 with Kim & Reggie Harris, and several compilations. Their first, Magpie & Friends, and their third, If It Ain’t Love, showcase their broad range of styles and themes. Their second album, Working My Life Away, is an excellent collection of songs about working people and their work. Their fourth and fifth albums, Living Planet and Circle of Life are both theme albums on the subject of the Earth. Circle of Life is Magpie’s first album for children and has been greeted with great acclaim by children, parents, and educators, and such environmental notables as the National Audubon Society. A portion of the proceeds from both of these albums is donated to environmental action groups. The Smithsonian, when it released its monumental collection, Folk Song America: A Twentieth Century Revival in 1991, included Magpie’s rendition of “Sacco’s Letter to His Son” from If It Ain’t Love among selections by 99 of the most eminent folk music artists of our time. Terry and Greg’s sixth album, Seed on the Prairie, is a showcase for their songwriting. It is full of songs which tell stories of love, loss, and rebirth, and songs of Mother Earth. In 1994, the Cultural Center for Social Change produced a 2 CD set of songs of the Civil Rights movement to commemorate the 30th anniversary of the Mississippi Freedom Summer Project entitled Freedom is a Constant Struggle, and Magpie was honored with an invitation to participate, contributing 3 selections, two recorded with their very close friends, Kim & Reggie Harris. Through CCSC, Terry and Greg have performed in concert with SNCC Freedom Singers Matthew and Marshall Jones and Emory Harris and with Wazir Peacock, SNCC song leader, singing with them, and on their own, songs of the Civil Rights Movement and other songs of struggle. The concerts have taken place in various venues including the Kennedy Center, and two of them have been recorded and released on CDs entitled The Long Walk to Freedom and Songs of Dissent Live. This was followed by a collaboration with Kim & Reggie Harris entitled Spoken in Love, recorded in concert in early 1995. Their quartet appearances with Kim & Reggie have been received with standing ovations from audiences around the country, including Bethlehem Musikfest and the Philadelphia Folk Festival. The quartet was invited to appear on National Public Radio’s All Things Considered in an interview with Daniel Zwerdling to talk about their work together and the uplifting and powerful effect their music has on audiences. The quartet then recorded and released a studio recording, entitled Guide My Feet, on Appleseed Records, featuring guest appearances by such luminaries as Pete Seeger, Jay Ungar and Molly Mason, and Keter Betts. In the spring of 1999, Magpie’s 9th recording, a celebration of their 25th anniversary entitled Give Light was released on Sliced Bread Records. The CD features songs old and new, written by friends and heroes and by Magpie themselves. There are love songs, songs of struggle, songs of the Earth, and songs of the spiritual journey. Magpie’s most recent recording is entitled Sword of the Spirit and features 11 songs including 7 originals, all about famed abolitionist John Brown, his family, friends, and associates. The CD, also on Sliced Bread, was produced as a companion piece to Greg and Terry’s one-act play of the same title based on the life and letters of Brown and his wife Mary. The premier performance of play, featuring Greg as Brown and Terry in the role of Mary Brown, took place February 18, 19, and 20, 2000 at the Old Opera House in Charles Town, West Virginia, across the street from the old courthouse where John Brown was tried and convicted in 1859.